Trace Configuration options define the way trace events are generated and captured. ULINKpro can deliver captured data in real-time. Open the dialog Options for Target — Debug. Enable Use and select ULINK Pro Cortex Debugger. Click on the Pack tab if available, and check Enable. Refer to Pack Options for details. When the Pack tab is missing, use an Initialization File to Configure Cortex-M Devices for Tracing. Click on the Trace tab and set the options. General Settings set the overall behavior. Trace Port defines the trace channel and speed. 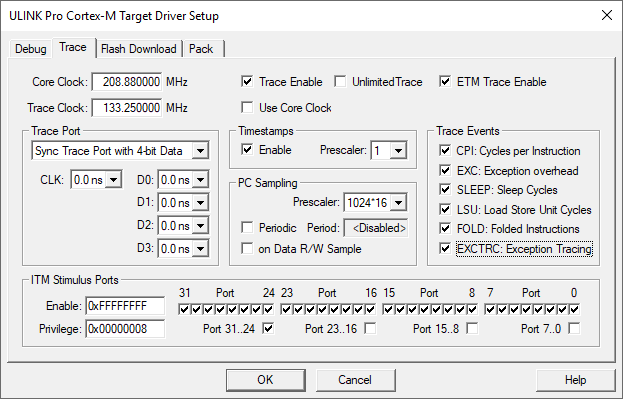 ITM Stimulus Ports steer debug or program-specific information received from the target device. Timestamps send time information along with trace events. PC Sampling identifying the program location that triggered the event. Trace Events trigger information on specific CPU events.